Power factor and power factor correction have become major issues for designers who are selecting or using AC-DC supplies and subsystems. Although these two topics were not a major concern of most supply users until relatively recently, they now demand consideration. What is power factor (PF)? When an AC line is driving a purely resistive load such as an incandescent bulb, the line’s sinusoidal current and voltage waveforms remain in phase (0â° difference) with each other, and the power factor is unity or 1.0 (the cosine of the phase difference). However, when the load is linear but reactive, the voltage and current waveforms remain sinusoidal but are no longer in phase, and the current leads voltage with a capacitive load and lags voltage with an inductive load, Figure 1. Adding to the problem is that current/voltage relationship is more complicated for non-linear loads such as diodes and rectifiers, Figure 2. Power factor is measured as the ratio of the real or active power P (watts) and apparent power S (volt amperes): PF = P/S. When the source is delivering power to the load, the PF can range between 0 and 1; when the load is actually returning power to the source, the PF will be between 0 and -1. There are several reasons to be concerned about power factor. First, a non-unity PF represents a waste of power (inefficiency), which has both thermal implications as well as cost impact due to power dissipated but not actually doing useful work. Secondly, with non-linear loads, the original sinusoidal waveform becomes distorted and generates harmonics onto the power line, which leads to a variety of negative effects for the line, the source, other loads, and even nearby systems due to emitted EMI/RFI. 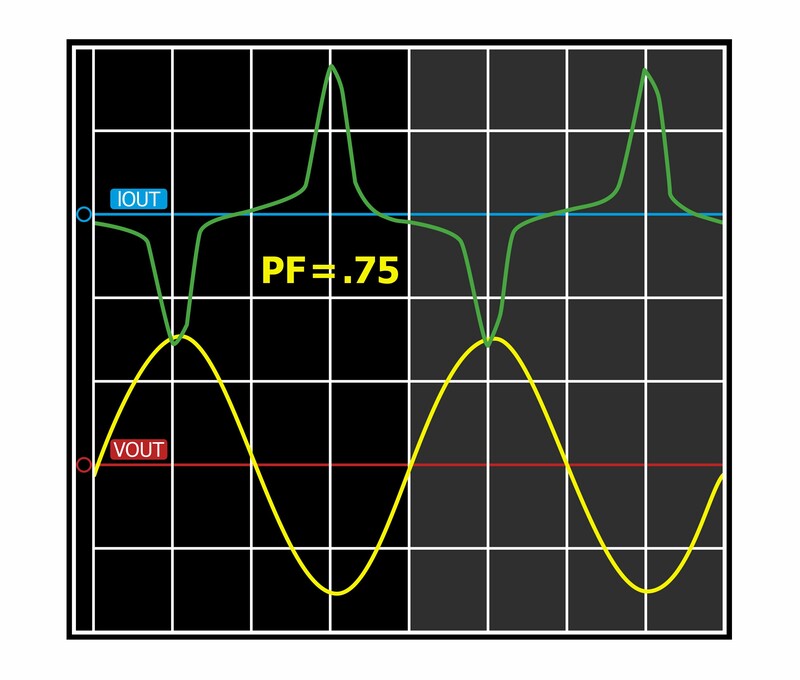 As a result, engineers strive to achieve PF close to unity by implementing power factor correction (PFC). How close depends on the size of the load, and the various regulations and standards that have been put in place regarding power factor. In general, larger (higher wattage) loads are required by the standards to have a PF closer to unity than smaller loads must provide. It may be hard to find a supply with PFC and with the needed voltage/current ratings, multiple DC output rails, and desired form factor from a credible vendor; alternatively, the designer may be constrained and reduced to selecting a less-than-optimal supply for the application or have fewer vendors to consider. This is also a consideration if the supply must meet special requirements ruggedized industrial ratings. The design may have two or more independent supplies, in which case each supply must carry the cost of internal PFC circuitry. A PFC function embedded within an AC-DC supply usually has minimal functionality or additional features which, if available, would yield better, more consistent performance, and enhanced system integrity. Fortunately, there is an alternative: choosing instead to use a dedicated power-factor correction module with a non-PFC converter. This module is optimized for superior PFC performance, and can also incorporate additional features and flexibility. In this way, preferred supplies can be used while the overall AC-DC power-supply function of the system will be enhanced. A good example of such a dedicated module is the PFCQor Power Factor Correction unit from SynQor, Inc, Figure 3. This device, housed in an industry-standard half-brick form factor (2.4 Ã— 2.5 Ã— 0.51 inches which equates to 60.6 Ã— 63.1 Ã— 13mm) is placed between the input AC-line filter and the DC-DC converter or converters, Figure 4. 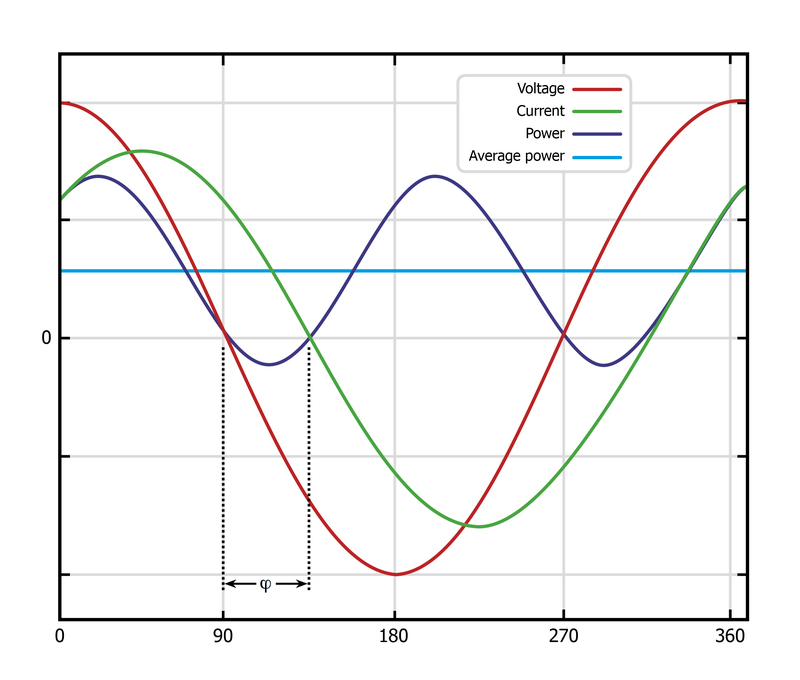 It shapes the input current that is drawn from a single-phase sinusoidal AC source into a nearly perfect sinusoidal waveform, so that the DC-DC converter will present a very-high power-factor load (PF > 0.99) to this source. The PFCQor ensures that the harmonic components of the AC current waveform are well below the levels called by relevant regulatory standards, and total harmonic distortion of the AC-current waveform is typically less than 10%. 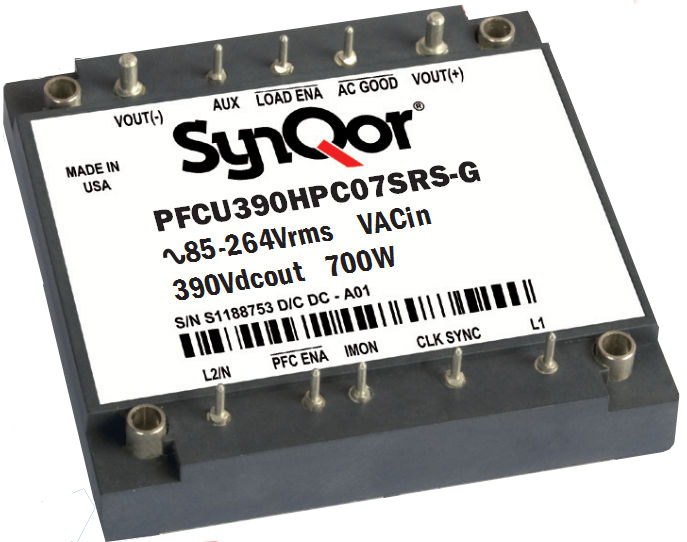 Figure 3: The PFCQor Power Factor Correction module from SynQor, model PFCU390HPx07, works with a non-PFC supply (or supplies) and a user-supplied hold-up capacitor to bring the power factor up to 0.99, very close to the ‘perfect’ value of 1.0. Figure 4: The PFCQor module is placed between an AC line filter and one or more DC-DC converters supporting a load rating up to 700W. The PFCQor does this by first rectifying the filtered AC-source voltage and then processing the input power through a non-isolated, high-efficiency, high-frequency ‘boost converter.’ This gives the input AC current its sinusoidal shape, and provides a regulated DC voltage across the user-supplied, external hold-up capacitor. The hold-up capacitor (typically 200 to 500 Î¼F) handles the cyclic imbalance between the flow of energy drawn from the AC source and the flow of energy delivered to the DC-DC converters. It is also a source of energy so that the DC-DC converters can continue to deliver load power during a temporary brownout or dropout of the AC source. 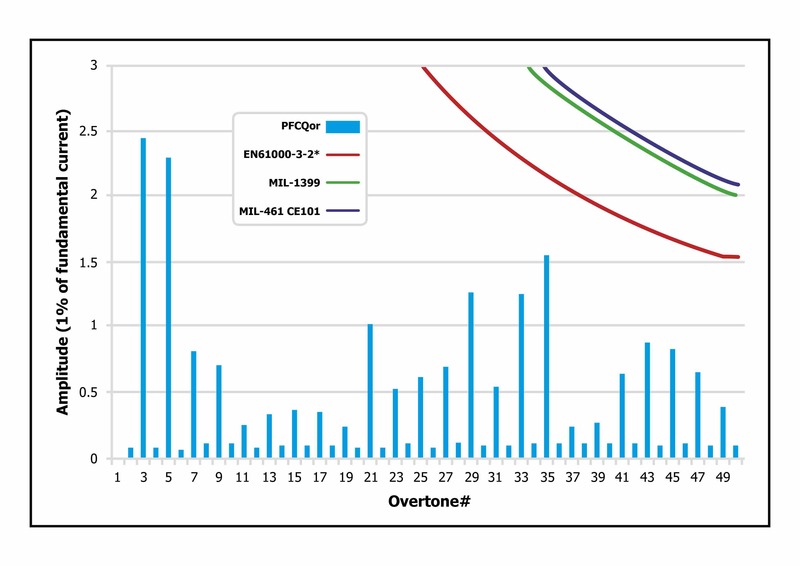 The PFCQor module can provide its high performance across a wide input-voltage range. The module works with AC-line voltages from 85-264 Vrms, with efficiency of >96% at 230 Vrms and >94% at 115 Vrms. Furthermore, since it is independent of the DC-DC converter, this module can incorporate a variety of operational, control, and protection features which are beneficial to both the supply subsystem and overall product performance. For example, it limits the inrush current that can be drawn from the AC source to charge to hold-up capacitor, thus avoiding sudden dips and transients, it limits the DC current that can be drawn from its output and it will shut-down if a short circuit appears across that output (due a problem with the DC-DC supply or their interconnections). As a further protective function, it shuts down (with auto-recovery) if the AC-mains voltage at the input is too high or too low for longer than a specified time (this is due to external issues beyond the designer’s control), or if its own temperature exceeds the allowed threshold. Architecturally, the module is designed with flexibility that works in two ways. A single PFCQor can support one, two, or more supplies in parallel, as long as their total load is within its 700W rating. The complement of this arrangement is available, as well: multiple PFCQor units can be used in parallel, if the supply load exceeds the 700W value. Designed-in safety and regulatory compliance are additional benefits of this dedicated module. Isolation between input/output connections and the baseplate is 2150 Vdc, and the unit meets safety requirements of UL 60950-1:2007, CAN/CSA-C22.2 No. 60950-1:2007, and EN60950-1/A12:2011. In the challenging regulatory environment, it exceeds the stringent mandates of EN55011 and EN55022, EN61000-3-2 and EN61000-3-3, and EN61000-4-4/5/6/11, Figure 5, when used with the SynQor AC-line filter. The fully encased module is also complements enclosed or potted DC-DC supplies which are needed in industrial settings and other harsh environments. While an AC-DC supply with internal PFC circuitry seems like a simpler, quicker solution to the power-factor challenge, from a system standpoint it actually can be more costly in performance, limited in flexibility, and lacking in useful features. 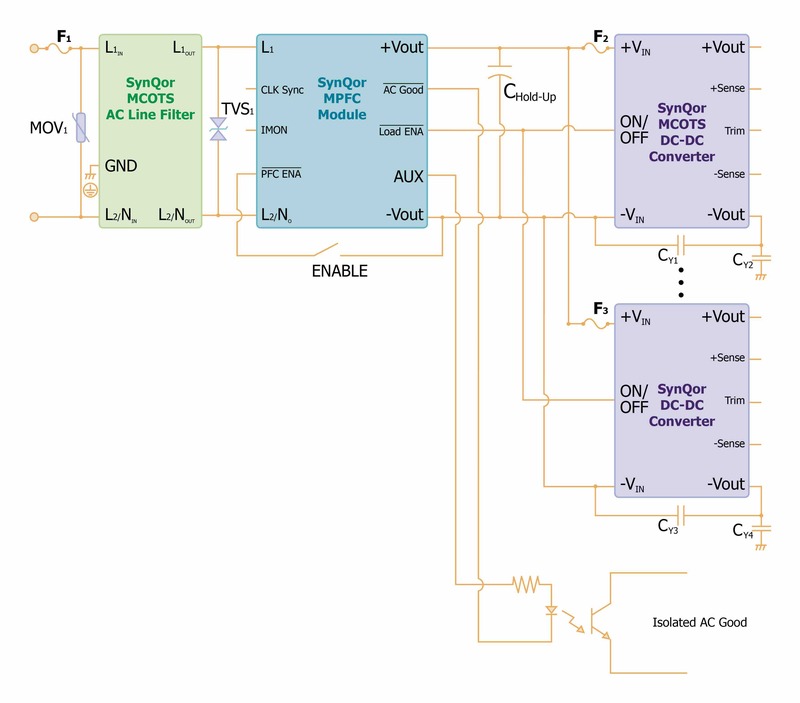 For these reasons, a standalone PFC module such as the PFCQor from SynQor is worth a close look by designers, as they work out the supply subsystem architecture and fill out the BOM.